How do I list all key-bindings available in a given buffer? I am trying out a new major mode, how can I take advantage of Emacs' documentation system to get a listing of key bindings available in that specific buffer? C-h b will list all the bindings available in a buffer. This is a mnemonic for help (C-h) bindings (b). You can also get a list of keybindings via C-h m, which is help for the major and minor modes for the buffer. The formatting of this is a little clearer, but includes additional information about the modes beyond just listing the keybindings. For any selection in the list, you can choose to either perform the action, or to jump to the documentation for the command. Although not the canonical emacs way of doing things, I quite like using discover-my-major for that purpose because it just feels more effective. It is available on melpa and is powered by the makey library, which is responsible for those nice menus magit is known for. I'd suggest you check out the github link for a screenshot demonstrating the functionality. Although not exactly what you are looking for you might want to try out guide-key. If you enter a prefix sequence without completing it guide-key will pop up a buffer showing you the available completions and what functions they execute. 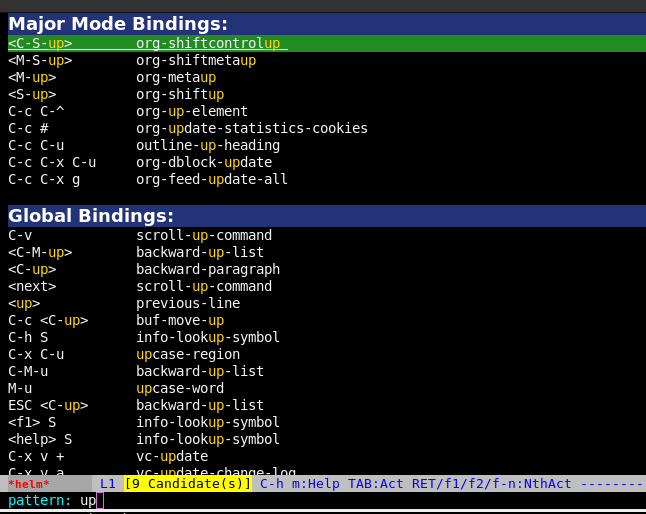 I find this very useful when I need to learn new bindings in Emacs. You may want to look at C-h m that lists all key bindings of major mode and minor modes. Read more about other Help commands here. Emacs help system is rich. Icicles key completion gives you all of the info you get from C-h b (describe-bindings), C-h w (where-is), and C-h c (describe-key-briefly), rolled into one. Just hit S-TAB anytime at top level. Every key sequence that you can possibly type in the current context (with the exception of keys such as q that just insert characters) is displayed in buffer *Completions*. This tells you which keys are available now. The command that each key sequence is bound to is also shown in *Completions*, next to the key name (e.g. b = bookmark-jump). This gives you a rough idea what the key (e.g. b) does. Each key sequence that is bound locally, that is, each key that has a special meaning for the current buffer mode, is highlighted in *Completions* with a pale yellow background. This tells you which bindings are those offered by the current mode. Click C-M-mouse-2 on a key name (with its command name). A *Help* buffer opens with a complete description of the command bound to the key. This tells you what the key sequence does in detail. Click another key (command) to get help on it, and so on… You can do this all day, browsing through the available key bindings to learn what they do. This is a great way, in particular, to learn about the keys defined by a given mode. If you want to then use a key (command), then just click mouse-2 on its name in *Completions* (or complete the key + command name and hit RET). Or cancel, using C-g, and hit the key as you would normally. You can even complete menu-bar menus this way, by accessing the pseudo-function prefix key menu-bar. Not the answer you're looking for? Browse other questions tagged key-bindings keymap major-mode or ask your own question. How to find all active bindings which act on a region? 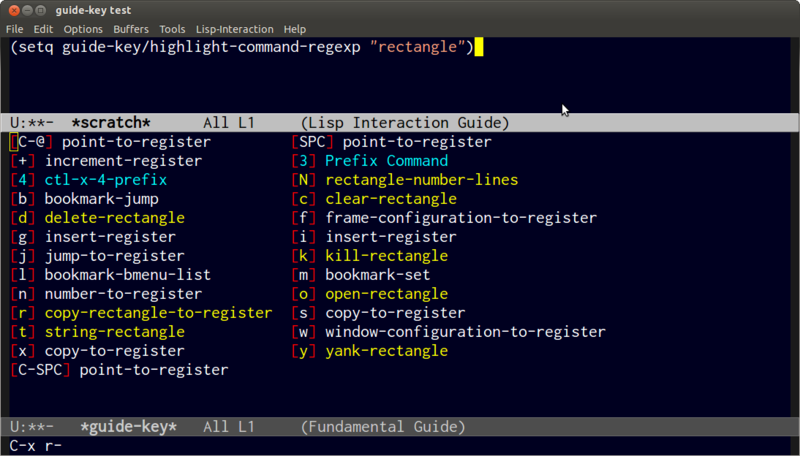 Managing Emacs key-bindings in other applications? How to define key bindings for major mode extensions? how to add a prefix key to all keybindings of a specific mode? How to prioritize key bindings between modes?